Note - blind and visually impaired players may wish to look at our Blind and Visually Impaired Player Support page for screen reader compatible clients. This list of alternative mud clients is intended for people who are either looking for a more advanced client, or for one that works better than what they currently have. For blind players, selection of the proper client can often be painful, as screen readers can be very finicky. We tried to sort them so that the most common and useful clients were at the top of the list, but by no means do you need to descend the list in order to find what is best for you. There are many entries, so with any luck several of the clients below should work for you. All of these clients are usable on Windows PC computers. Some of the really old ones may not work well on Windows XP and Windows Vista. This custom client was specifically designed for playing Alter Aeon. It has a number of features not found in other clients, including a built-in mapper, group windows, chat windows, health bars, popup status, and more! Highly recommended for new players. Back from the dead, the popular old client TinTin++ has been brought to life as a sourceforge project and is now available for download. This client was the de-facto standard client for many years, but fell into disrepair when other clients such as CMud became common. There's also a custom Alter Aeon sound and trigger pack maintained by the player Tux at GitHub: Tintin-AlterAeon. This open source client is freely available and works very well. The world list contains Alter Aeon, so just select it and you're ready to play. Normally, you have to register this shareware client after 30 days, but for Alter Aeon players it's totally free. This is a very full featured client, but does not currently have good support for screen readers. This is considered one of the best clients for Microsoft Windows based systems. Has autologin ability, aliases, automatic timers and triggers, overhead mapping, and most anything else you would want. It also has Alter Aeon's address in it by default, making it easy to find us and connect. Similar to zMud, JMC supports unlimited player profiles for any number of accounts, aliases, trigger actions with complex pattern matching using wildcards, custom key assignments for user-defined macros, variables, speed walking, auto map generation, and much more. VIPMud is a client designed for the blind and visually impaired. We have received good reviews for this client from our blind community. You can use it for a 30 day trial period, but after the trial expires some of the features are disabled. You may want to try it if other clients are not working well for you. 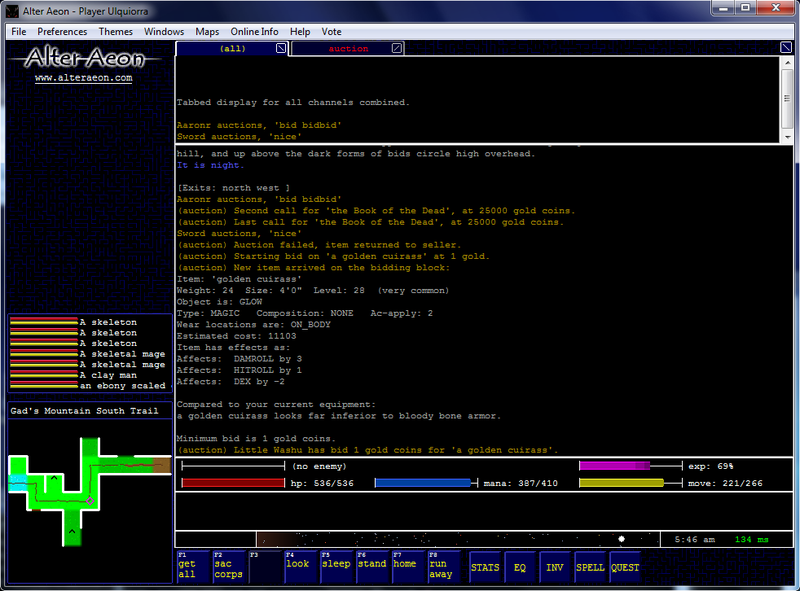 Mud Master is a 32bit mud client designed to run under Windows' console mode. The console mode is text based -- if you are looking for a graphical client with menus and a mouse-driven interface, MM isn't for you. Anybody familiar with Tintin should have no trouble getting used to Mud Master. Most importantly, Mud Master is FREE. The client is not crippled in any way, nor does it nag you to register. If you find the program useful you are welcome to use it all you like. Stick in the MUD is a full-featured MUD client, which stores a list of the MUDs you frequent, with autologin, triggers (including sound triggers), aliases, and infinite scrollback. Text resizes to fit the window, and you can pick any number of rows or columns that pleases you. It has a scrolling speed that has been complimented as both fast and smooth, and automatically adjusts to your computer. You can even adjust it yourself if you like. Fire Client is a client that can be used to connect to normal muds as well as muds enhanced with the Interactive Mudding Protocol (IMP). It supports all the features you would expect in a modern mudding client. For those of you who are stuck with windows telnet, you might need to turn on "local echo" and "line wrapping". You can learn some other tricks for improving the glorious windows telnet experience from our Tips and Techniques page for telnet users. These clients are for Macintosh computers. Some of them may require a specific version of MacOS. This open source client is freely available for Macintosh computers. Savitar is the Premier MUD / MUSH / MOO Client for the Macintosh. It has been in development for many years and is used by MUD players world wide.